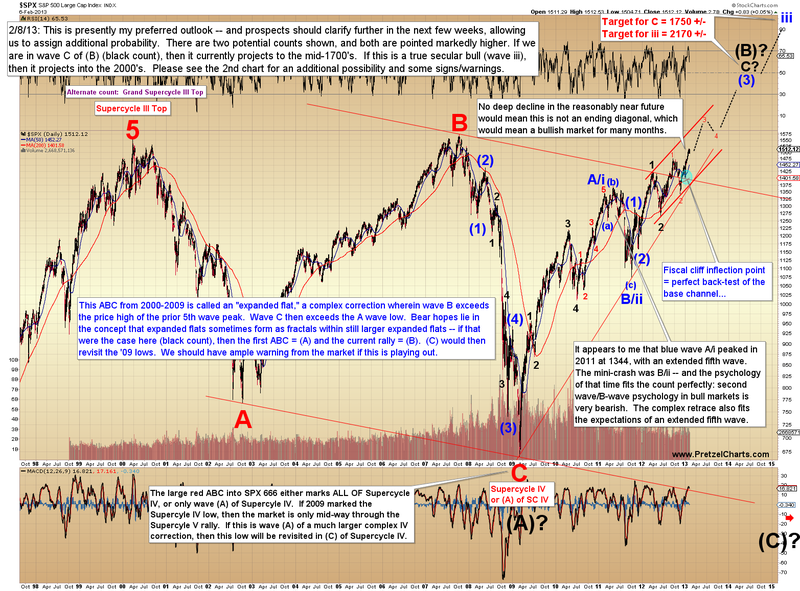 SPX officially made new all-time-highs recently, so before going further, we need to address the implications there. First off, let me preface this by stating that this is not going to be popular with bears. I realize that a lot of my readers are bears, but nobody should be trading with the "hope" that the market does something to justify their underlying bias. The only reason to trade is to try and be on the right side of the trade in order to earn a profit. If a trader is doing anything besides that, then they might as well just pile up all their money in the backyard and set fire to it, since that would ultimately be more fulfilling. Or, heck, give it to charity or something. I mention this for a reason. 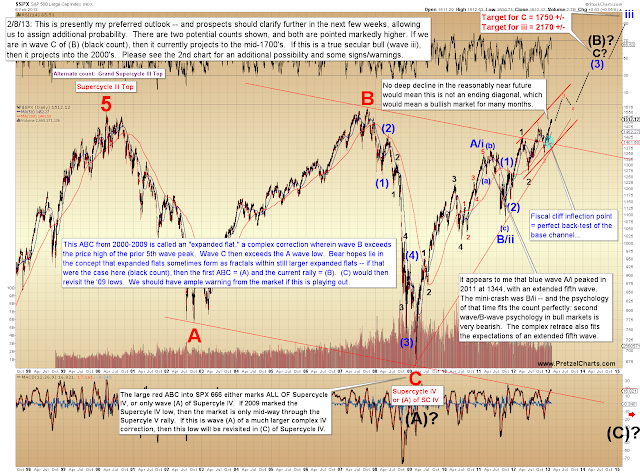 In mid-late 2012, I began to turn bullish; then, starting with my very first article in January 2013, I published a series of articles arguing that the market had just begun a massive rally. I even published an article titled "A Survival Guide for Bears in a Bulls World" (I still think it's one of my better pieces; might be worth a reread). In February 2013, I published my preferred long-term targets for SPX; my first target was SPX 1750, and my second target was SPX 2170 (chart below). All of this is intended to present an important point: In 2013, I lost a lot of bearish readers because of my bullish stance. Some bears got mad about it, and went to look for other analysts who would back up their biases, of which there are never any shortage. Not sure how all that worked out for them, but I do know how things worked out for the market. For the past few months, I've talked about the rally off the February low as the probable C-wave of a larger B-wave. A few times I addressed the fact that B-waves are allowed to break key prior levels (such as the all-time high). The issue for bears right now is that a B-wave that breaks a prior high is ultimately going to come back to that high, no matter what happens next. In other words, even if SPX were to drop 500 points next week, it would most likely recover shortly thereafter, and return to break current prices. That's an important understanding, because it means that whatever happens in the foreseeable future -- even if we got a huge drop from here -- will most likely still be occurring within the context of a larger ongoing bull market. So... that's what bears are up against here. At present, their best hope appears to be for a big C-wave decline that amounts to a temporary victory for sellers. At worst (for bears), they are up against a rally that is going to keep grinding higher, with only temporary reprieves, for quite a while. The chart below outlines the situation (as it appears at this exact moment) in a lot of detail. 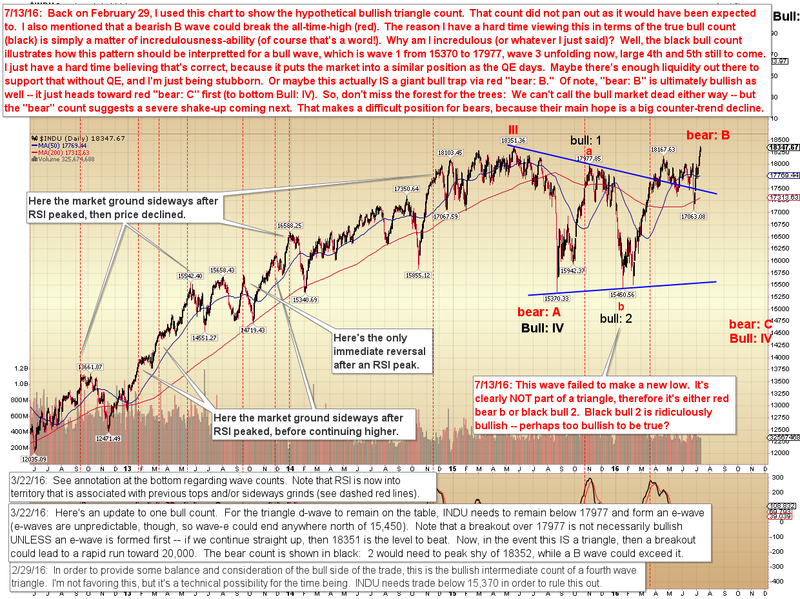 I used INDU because it did NOT make a new low at red b/bull:2, so the implications of its pattern are clearer -- and for that same reason (see chart) this is the market that has thus kept me somewhat skeptical for a while now. In conclusion, this is a very difficult position for bears to be in. If this rally is a bearish B-wave, then it may be nearing completion -- but as I mentioned at the beginning of the month, this is a very difficult type of wave to front run. The best thing we can do from here is watch for clear signals of a turn, then take it one trade at a time from there. Be aware that if the "incredulous" count shown above is underway (despite my skepticism), then bearish trades will only work on short time frames, and things will remain bullish for longer than probably seems reasonable. In the event the bearish B-wave count is correct, then the C-wave will be significant enough that it should allow time for bears to get on board. Trade safe.